Distinctive scent of jasmine flowers, is highly favored by many people, especially women. 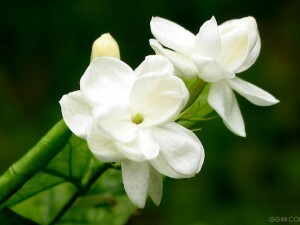 But in addition to the seductive scent of the flower, jasmine also has properties to help cure diseases. Plants that have a Latin name Jasminum Sambac or too often can be efficacious Jasmine disebutl help cure shortness of breath, headache, eye pain, fever, swollen with bee stings and even breast milk can also help control that often come out to excess. How to make: the material is boiled in 3 cups water to boil down to 2 cups and filtered. How to use: affixed around the breasts, every morning before bathing. How to use: affixed to the part that stung by bees. How to use: taped to the forehead, just replaced when it is dry, repeat until cured. How to make: the ingredients knead by hand, then soaked with water in a basket. How to use: water immersion is used to compress the forehead.